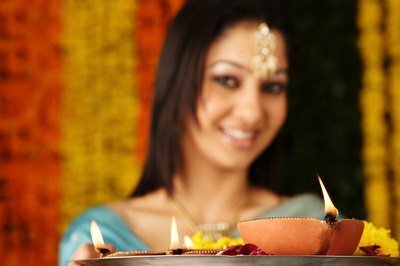 Diwali is a festival celebrated by some Indian cultures starting at the end of October or early November. The word "Diwali" translates to "the festival of lights" in Hindi. This is the time when Hindi people light diwas, which are small candles, and set them outside their homes to lead Rama, a historic hero of the Hindi people, home to his wife Sita after he defeated the demon lord, Ravan. This celebration can also extend to the office. Redesigning office supplies, such as a pencil stand, for Diwali is a simple process. 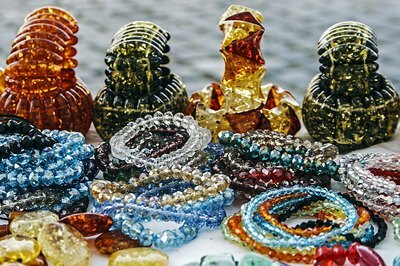 Decorate the pencil stand with plastic jewels in rows and a picture of Rama, or even Ravan, in the middle. Elephants are a recurring item in Indian art, so creating a pattern of them for the middle section of the pencil stand along with light colors and gold will make the stand beautiful for the holiday's celebrations. Rangoli patterns are drawn on the doorsteps of Indian family households, businesses and shops, with paint or chalk, to bring good tidings to the Diwali celebration. The rangoli is a specific pattern that has been passed down through generations depicting important characteristics of a family and symbolizes the historic tale of the battle of good, Rama, over evil, Ravan. The pattern of rangoli is symmetrical. The shapes and linear designs of the pattern tend to have a picture of Lakshmi, the Hindi goddess of prosperity, in the middle to show how good prospers. 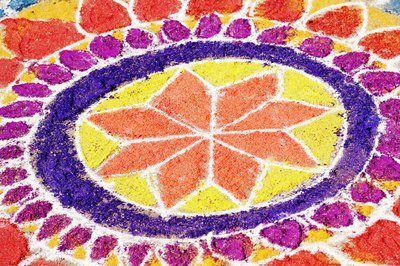 The rangoli is usually an intricate and beautiful circular design. Having a luncheon that is for Diwali will share the Indian culture with any non-Indian staff. The foods for an office Diwali celebration must be carefully chosen to maintain business luncheon rules and safeguard against possible allergies. Many Indian dishes are very spicy and may be too spicy for non-Indian participants. To remedy this issue and yet keep some spicy items available, make sure half the items are not spicy. It is also a good idea to bring in a couple of vegetarian dishes for any employees who do not eat meat. Colors that are bright and represent flames are used for decorating during Diwali. Place a bright yellow, gold or orange monitor screen cover around the computer monitor. Simply using the colors in a fun design will work, or liven up the office by making the monitor frame resemble flames. Hanging streamers of bright colors and changing the office window curtains to bright fabric can bring the celebration to the work place.